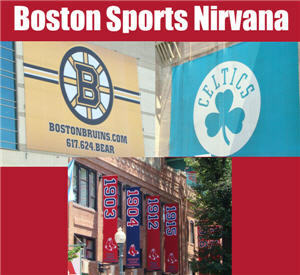 If you checked the Boston news or newspapers this morning (May 4th 2010) you would have seen what some in Boston would consider sports nirvana. The Celtics won their playoff game against a Cavaliers team that looked downright unbeatable the other day. The Bruins have taken a 2-0 lead in the playoffs against the Flyers with their 3-2 win last night and last but not least the Red Sox finally won. Not only did they win they hit an unbelievable 20 hits. All we needed was the Patriots and I would not be able to contain myself. I know I am biased but nowhere in the country do you get to see the level of competitive professional sports than in Boston. With the ascension of the Red Sox and the New England Patriots we have become used to world championships so much so that getting to the playoffs has not been enough for many Boston sports fans. The fact that the Bruins are into the second round of the playoffs and doing well brings us closer to championship level play from all 4 of our professional sports teams. I know the Patriots last Super Bowl win was in 2004 but remember we were also in the 2007 Superbowl though we lost. The Red Sox last World Series win was in 2007. The Celtics last world championship win was in 2008. The Bruins last Stanley cup win on the other hand was way back in 1972. We in Boston are known to be pretty hard on our sports teams even though they have brought us tons of hours of enjoyment. Win or lose enjoy this time Boston Sports fans! Don’t forget how lucky we are! But How Will They Wear The Rings? Is Jerry Remy’s Sports Bar Already Open?